On Wednesday's Windows Phone Developer Summit, Microsoft announced that Windows Phone 8 would use Nokia's mapping technology--the same mapping software you find on phones like the Lumia 900. 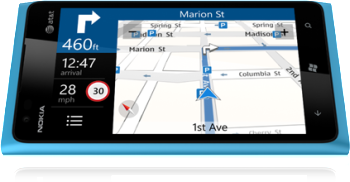 Nokia's maps will bring turn-by-turn directions to all Windows Phone 8 devices, as well as offline support and better local information. That means you'll be able to save maps for times when you don't have a data connection, and Local Scout (a feature introduced in the Mango update that shows local venues) will be improved with new information from Nokia maps. Developers will also benefit from the inclusion of Nokia's maps and will be able to create apps that take advantage of the robust mapping API. By bringing better mapping software to Windows Phone, Microsoft has thrown its hat into the ring with Google and Apple to see who can build a better mobile map experience. Only time will tell who will win out in the end, and we'll have to wait until the first Windows Phone 8 phones begin rolling out before we can test them out ourselves. Stay tuned to PCWorld for more news out of the Windows Phone Developer Summit.